Most of us still enjoy marveling at and using classic lures. But, modern designs, materials, and raw creativity have resulted in some impressive new creations that get fish to bite. Each year, we see unique twists and tweaks to some tried-and-true standards, as well as the occasional eye-catching innovation. This year, the tackle companies at ICAST brought some of both. From the eyes to the pincers, this lure looks like a real mudbug. The Jackall Chop Cut merges functionality with appearance. The Terminal Shudder Bait is built to push more water—creating a tantalizing disturbance that gets fish to strike. The Strike King KVD 1.5D is a tried-and-true design adapted to a deeper water-level. This soft-body lure offers realistic action and a solid hook. This bait was a cornerstone to Jason Christie’s third-place finish at the 2018 Bassmaster Classic. The Bill Lewis MR-6 works wonders in pressured fisheries. The Larew Wheeler Target Toad is big, heavy, and catches lunker bass. The CrossEyeZ Football Jig is made to bounce off the bottom. The versatile Thundermist JigEye works on open water and ice fishing. The PRO V’s holographic eye caps off a solid all-around crankbait. This swim jig is ready for dense underwater vegetation. When this glittery spoon glides on the fall, be ready for the strike. There’s nothing that sets off a fish’s predatory instinct like a lure that mimics a wounded prey. This one will make an impact for anglers fishing a bream bed or fry guarder pattern, which mimics the coloring of panfish. Following the general shape of these common species, the Spin Bomb emits a distinct shuddering action when paused—like wounded prey. The cupped design’s clear plastic props can spin at slower speeds with maximum spray. Twitching, ripping, or steady retrieving will activate that enticing action. Measuring 2 2/5 inches long and weighing 2/5 ounce, the Spin Bomb carries a set of Fusion 19TM hooks (feathered rear). A topwater blade with a soft-plastic shad makes a tantalizing combo. If there’s one thing that ICAST, the biggest sportfishing tradeshow in the world, has shown us, it’s that if there’s a task in the outdoors, there’s a tool for it. Sometimes, companies simply expand on the bread-and-butter concepts with better processes, improved materials, higher-end technology, and increased functionality. Other times, manufacturers come up with truly innovative ideas for problems or procedures not previously addressed. This year’s ICAST collection featured both types of developments and included products that ran the gamut from original rigging items to kayak-fishing tools. Here are the best new accessories you need to know about. Neko rigs allow you to fish soft-plastic stick baits at deeper depths. Trailers, like this Yakima Easy Rider, will instantly increase your kayak hauling capabilities. The Erupt Rod Threading Device is built to handle the pesky task of threading fishing line through your rod’s guides. This fishing net is designed with increasing the catch-and-release survival rate of fish in mind. Made with efficiency and catch-and-release capabilities in mind, this smartly-designed net features a Trophy Haul Yoke with an innovative handle that adds balance, strength, and leverage, while decreasing tension. Also, the Power Extend creates nearly 35 inches of handle length with the single push of a button. The design ensures that fish slide down the conservation netting at a gentle slope into the flat bottom, and a light module illuminates the reflective hoop for better subsurface viewing in low-light scenarios. The Cauldryn Fyre brings cutting-edge technology to the thermos. Outdoor gear is pricey—this lock keeps your stuff safe. These light strips only need some time in the sun to build a charge. 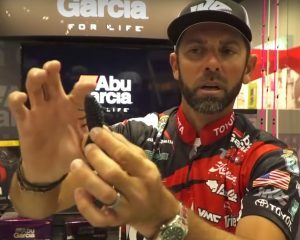 The Catch Commander is a practical scale for tournament culling. This toolkit has everything you need for removing fishhooks. This battery terminal multiplier is built to last. Need to get more out of your battery? T-H Marine Supplies has a solution for you in its new Hydra Battery Terminal Multiplier. With 3-way and 5-way terminals, the Hydra offers easily managed connections with lead-free, marine-grade zinc construction for improved conductivity and superior corrosion resistance. Make the most out of the limited space on a kayak. These all-in-one shears are perfect for prepping bait and cleaning fish. Fight like you mean it with the Pole Daddy Rod Holder. This set has all the blades you need to make the perfect fillet. The ChowPal is much more than just an eating utensil. Derek’s Update – Prayers Needed! Surgery Today! Thank you all for supporting Derek! For those that missed the previous video, Derek Sonnenfelt is a subscriber and member of the TacticalBassin family. A few weeks ago he was at a grocery store when an elderly man hit the wrong pedal, jumped a curb, and pinned Derek between his car and a concrete wall. Derek’s leg will be amputated today (July 28th). The 3 hour surgery is scheduled from noon to three (Pacific Time). Your prayers are needed! We are praying for the doctor’s wisdom as they make decisions that could alter the rest of Derek’s life. We also pray for peace for Derek and his family throughout both the surgery and the recovery period after. For those that want to continue to support Derek and his son through this time, a Go Fund Me has been set up. The Tacticalbassin community has come around Derek already but he needs all the help he can get. Adapting to life as an amputee will take time. If you feel compelled to support him financially use the link below. We appreciate you! THANK YOU for being a part of the TacticalBassin family!